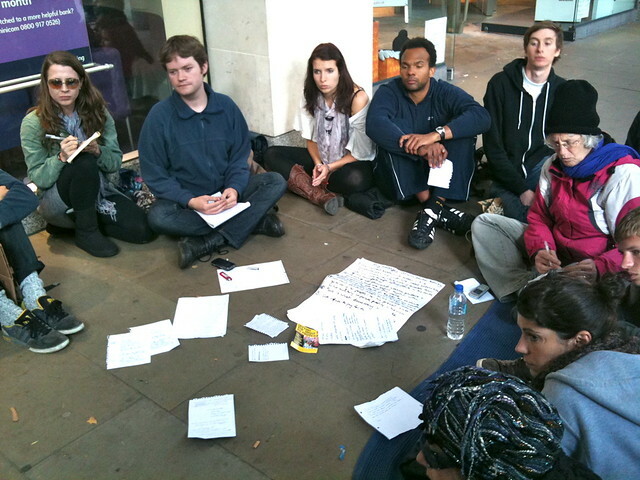 On Sunday the 15th October, I spent the afternoon at the Public Assembly convened as part of the Occupy London protest. It was inspiring to participate in real-time public democratic organisational processes and decision making, it's something I have been familiar with, on a smaller-scale, as part of Critical Practice and specifically the Parade project. 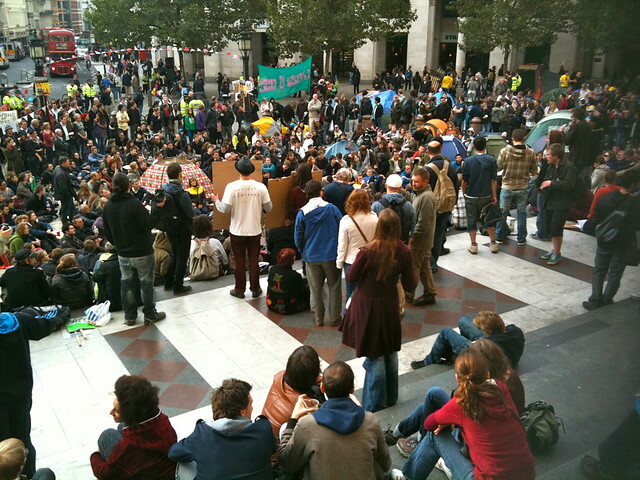 At the Public Assembly of over 500 people on the steps of St Paul's, #occupylsx collectively agreed the initial statement below. Please note, like all forms of direct democracy, the statement will always be a work in progress. 2. We are of all ethnicities, backgrounds, genders, generations, sexualities, dis/abilities and faiths. We stand together with occupations all over the world. 3. We refuse to pay for the banks' crisis. 6. We support the strike on 30th November and the student action on 9th November, and actions to defend our health services, welfare, education and employment, and to stop wars and arms dealing. 7. 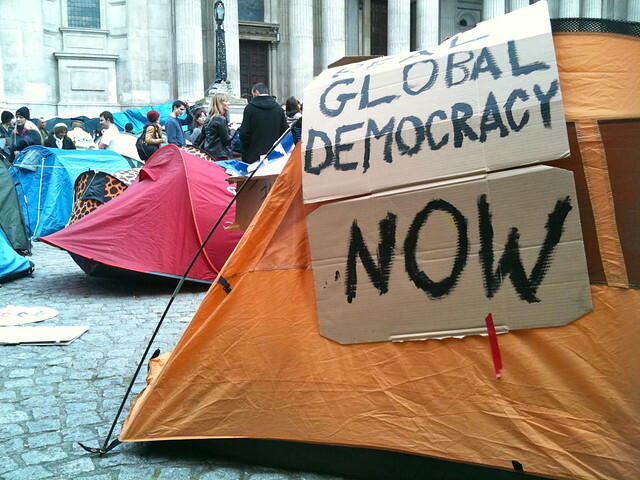 We want structural change towards authentic global equality. The world's resources must go towards caring for people and the planet, not the military, corporate profits or the rich. above: a working group in action. 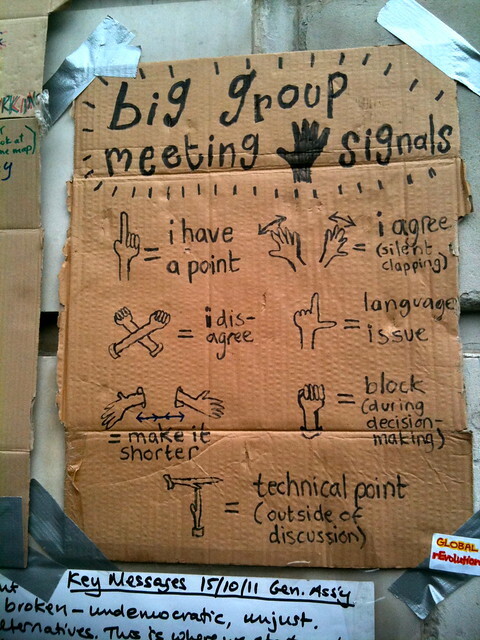 A nested sub-group of demands was developed and ratified by the Public Assembly on Friday 28th October, aimed at democratising the City of London. • An end to business and corporate block-votes in all council elections, which can be used to outvote local residents. • Abolition of existing "secrecy practices" within the City, and total and transparent reform of its institutions to end corporate tax evasion. • The decommissioning of the City of London police with officers being brought under the jurisdiction of the Metropolitan police force. • Abolition of the offices of Lord Mayor of London, the Sheriffs and the Aldermen. • And a truth and reconciliation commission to examine corruption within the City and its institutions.